Here are some of the flyers and other materials that we use at the FSF in our advocacy of free software. If you have materials of your own that you'd like to share with us, please send them to us at <info@fsf.org>. Email self-defense This quarter sheet handbill introduces people to our Email Self-Defense campaign. Privacy is impossible without free software This poster is perfect for hanging up in your home, workplace, or local hangout. 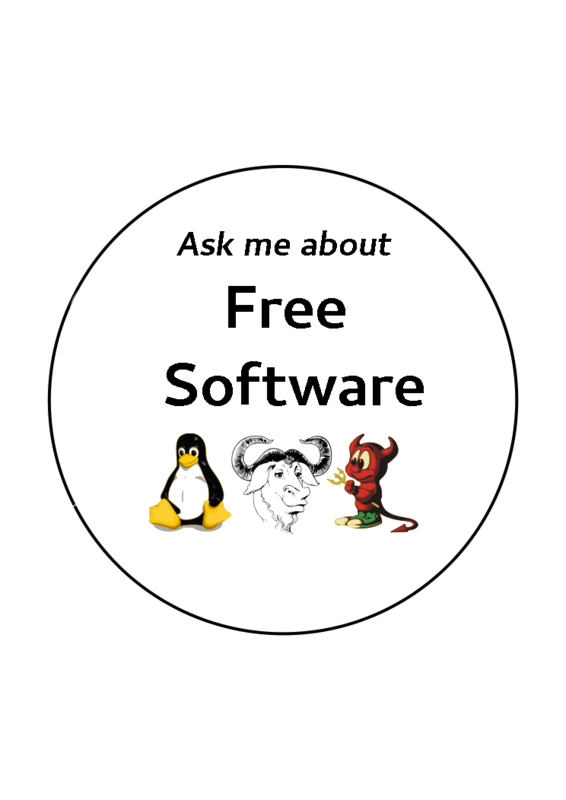 What is free software? This basic handout introduces the concept of software freedom. PlayOgg This basic flyer introduces the PlayOgg.org campaign and the benefits of free media formats. Stickers for your own uses, local conferences and more. Our flyer to demand that libraries (the Boston Public Library, specifically) remove DRM from their collection. Defective by Design flyers introduce the basic ideas of Digital Restrictions Management. FSF contact cards: We hand these out at events so people can request more info about the FSF, and get involved. Posters for various FSF events, including Richard Stallman talks. Flyer for "intellectual property" events: A printable version of Richard Stallman's article, "Did you say 'intellectual property'? It's a seductive mirage." Usted puede imprimir el botón "Pregúntame acerca del software libre" y llevarlo con orgullo. LibrePlanet 2018 flyer quarter-sheets Promote the upcoming LibrePlanet 2018 Conference with these handy mini-flyers!